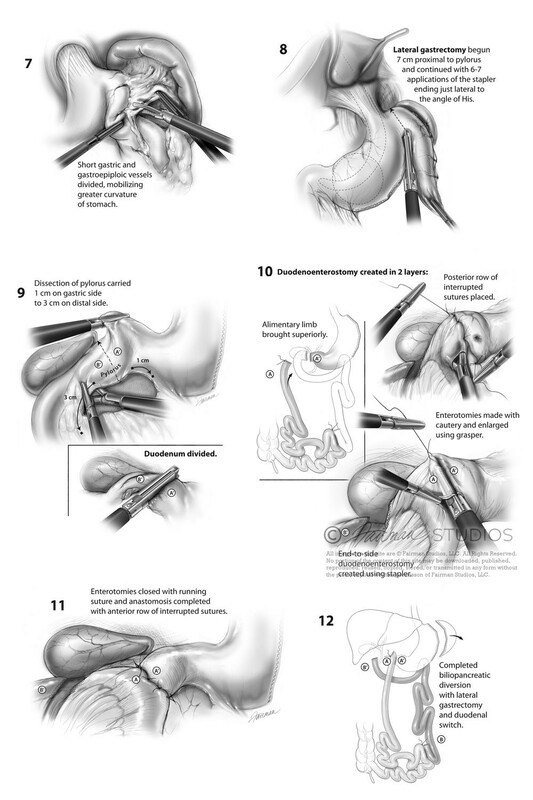 ‘Sleeve’ Gastrectomy and Duodenal Switch: Traditionally biliopancreatic diversion with lateral “sleeve” gastrectomy and biliopancreatic diversion has been performed as a single or staged procedure for patients categorized as “superobese”. The technical challenges of performing the procedure laparoscopically combined with the associated severe nutritional deficiencies have made this combined procedure less popular in recent years. Initially offered as the first part of the staged procedure prior to weight loss, the Sleeve gastrectomy has become increasingly popular as a stand-alone procedure. Reports of excellent weight reduction have become increasingly common in the literature resulting in the acceptance the procedure by the American Society of Metabolic and Bariatric Surgery as a surgical alternative in select patients. Although considered to be technically less challenging to perform by many minimally invasive surgeons, the risk of leak from the long gastric staple line, gastric dysmotility and treatment failure due to delayed dilation of the stomach should warrant caution among inexperienced bariatric surgeons. The biliary pancreatic diversion creates a malabsorptive state in which bile and digestive enzymes within a long afferent intestinal limb contacts food within a “common channel” measuring only 100 cm. The alimentary limb of the Roux-en-Y measures only 250 cm from its anastomosis with the duodenum to the cecum. The small intestine is normally 600 cm long (with some variation), so in this operation, the total length of the small intestine is shortened to about 40% of normal, but the length of the “common channel,” where digestion of complex fats and proteins occurs is only 1/6 or 16% of normal. 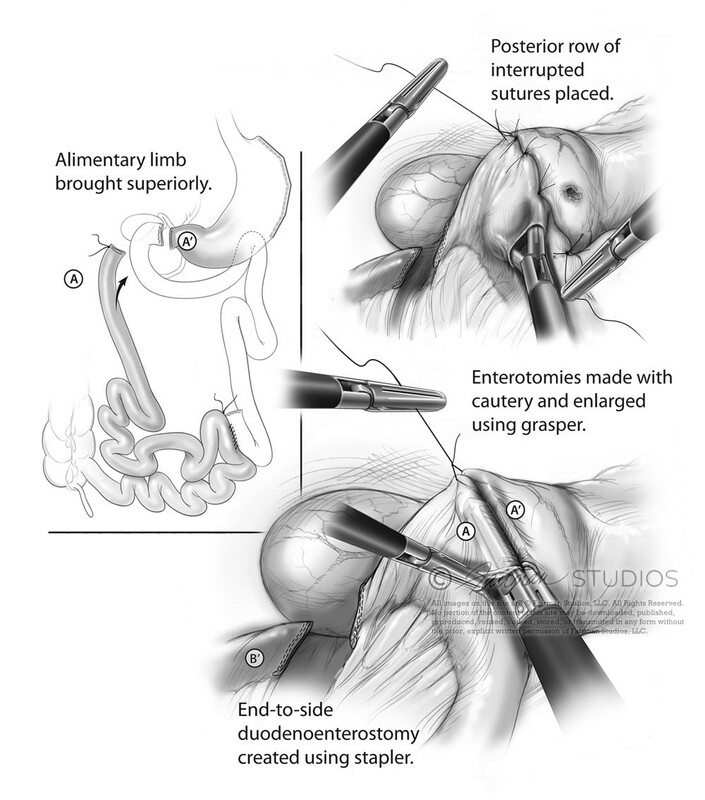 When combined with the lateral gastrectomy the procedure accomplishes dramatic weight loss by creating both severe restrictive and malabsorptive conditions.